Actual :1:51 p.m. Least : 10:51 a.m.
After Phobos Grunt you might wonder what is in store for us ? or What is Next? Here is another 2000kg Satellite on its way to earth in next two days. When will it Reenter Earth ? As per AEROSPACE - Center for Orbital & Re-entry Studies ( as per 17 JAN 2012 07:43 UTC update) says : the Cosmos 2176 is actually predicted to re-enter at 04:25 a.m. on 18th Jan (22.55 UTC on 17th Jan ). However due to atmospheric and other effects it may re-enter Earth between 00:25 a.m. IST on 18th Jan (18.55 UTC on 17th Jan) to 08:25 a.m. IST on 18th Jan (02.55 UTC on 18th Jan). Joseph Remis (as per 16 Jan 21.53 update) says : the Cosmos 2176 is actually predicted to re-enter at 1:51 p.m (8.21 UTC). However due to atmospheric and other effects it may re-enter Earth between 10.51 a.m. IST (5.21 UTC) to 04:51 p.m. IST (11.21 UTC). As per space-track.org ( as per 15th Jan 10.55 UTC update) says : the Cosmos 2176 is actually predicted to re-enter at 09.34 a.m. on 16th (4.04 UTC on 16 Jan ). 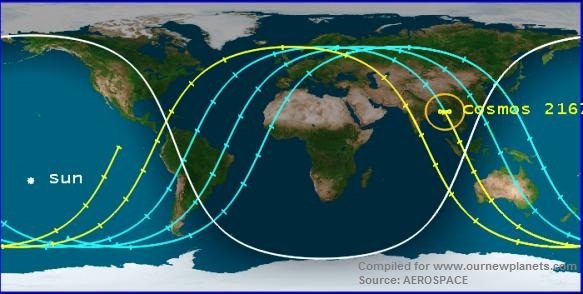 This satellites is Predicted to Reenter on 17th Jan 2012 at 19.15 UTC . (00:45:00 Wednesday January 18, 2012 in Indian Standard Time) However satellite may re enter earth 15 hours before or Later due to various factors. Where will it fall or what will happen to it ? Not much is known about this aspect. Our efforts to trace a source in this regard for Last two days failed. How/Can you track this Satellite live ? This alternative link click here can make good video if you record.